I wanted to expand upon that post by discussing additional opportunities at the 2014 Bucks County Designer House in particular. Just before opening the house to the public, the Designer House Committee hosts a Gala or Fete. This is a lovely affair, with ticket prices well over a hundred dollars each and cocktail attire required. Dinner, live music, dancing, and a house tour on a lovely spring evening–what could be better? The Designer House Gala also provides a bit of a celebration for the designers and volunteers, who are thrilled and proud to see the rooms complete. Of course the Gala also serves as an unveiling of the designers' art to the eager public. 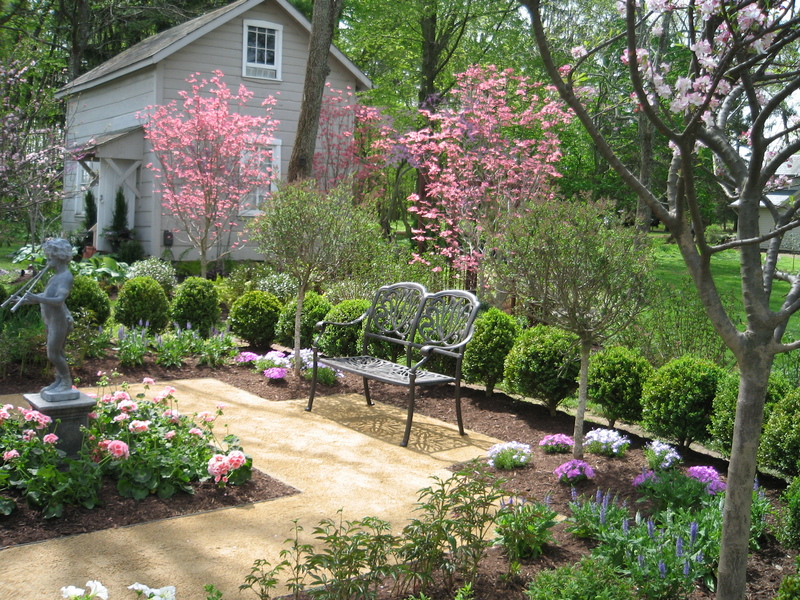 A beautiful garden setting at a past Bucks County Designer House. If you can’t make it to the Gala, you’ll have plenty of opportunities during the month of May. If you’re really interested in taking your time inside the house and poring over each of the rooms, a rainy day will probably be the least crowded. Don’t worry, you’re allowed to revisit the exterior of the property at any time with your ticket, so you can feel free to come back on a sunny afternoon simply to enjoy the gardens and the shops. 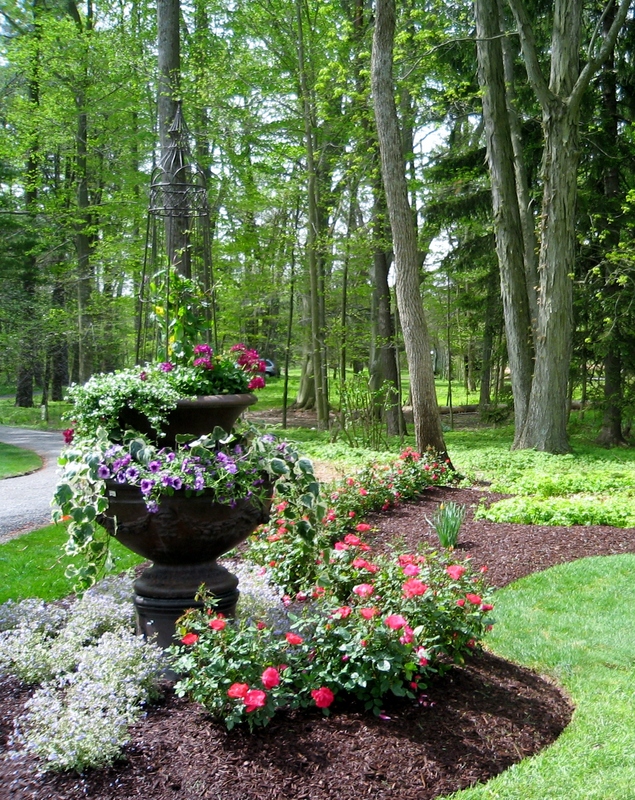 Another gorgeous landscape installation at a past Bucks County Designer House. Did I forget to mention the shops? The Bucks County Designer House always has several great boutiques on-site featuring items for the home and fashion-related items too! I always find a cute scarf or piece of jewelry at the BCDH. Don’t forget that the designer house rooms also feature items for sale. Each room has a price list which has numbers corresponding to the room’s contents. All room purchases have to be picked up after the designer house ends during the first week of June. There are some beautiful items inside the designer house, hand-picked by the talented designers. Plus, a portion of every purchase goes to benefit the Doylestown Hospital, so you’re doing a good deed while enjoying your shopping experience! 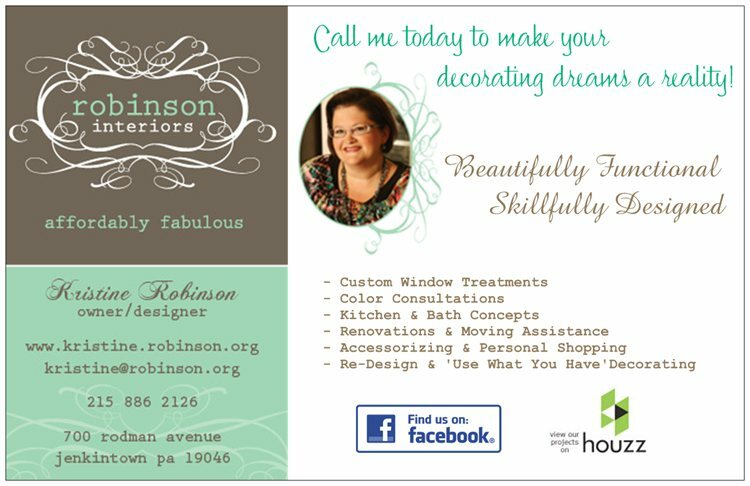 Until next time, tell everyone about Kristine Robinson’s Blog…I need all the friends I can get! This entry was posted in Bucks County, Designer House, Gardens, Home Decor, Interior Design, Landscape, Uncategorized and tagged Bucks County Designer House, Decor, Decorator, Designer, Flowers, Garden, Interior, Interior Decorating, Sunroom. Bookmark the permalink.